I do not know what possessed me to make croutons. I really do not like croutons. They are usually hard as rock and have no flavor. Before I realized I had gluten issues I still would not have croutons on my salads. I would always request them to be left off my food. It has been years since I actually ate one – Years. For some reason I thought they would go really well with some soup I was making. That (the recipe) will be in another post. I think too, it was because I had part of a loaf of my GF bread that was starting to get stale. That bread is too good to waste. So here we are talking about making croutons. I will be honest I think I am a total convert, at least for my croutons I will be. My husband and I kept eating them right off the pan, still hot from the oven. Just thinking about them makes me smile. I have already got some ideas for these little gems of goodness. You can make these with any bread, but honestly my GF sandwich bread is awesome. Which will make these croutons even better. You only need 3 ingredients. Cut bread into large cubes. Spread out evenly onto sheet pan. Drizzle olive oil over bread cubes. Generously sprinkle all-purpose seasoning onto bread. Stir with hands so that bread cubes are evenly coated with olive oil and seasoning. Bake in oven for a total of 20 minutes, until the bread cubes are golden. Stir after ten minutes. Remove from oven. 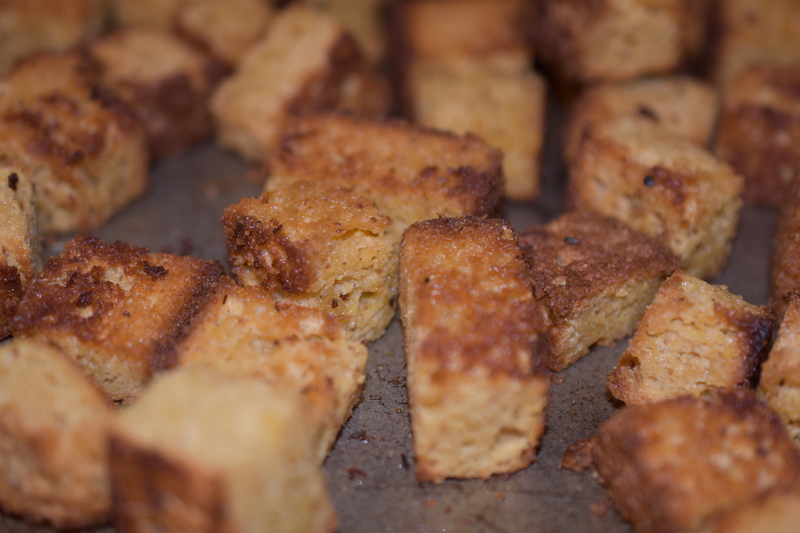 To store the croutons make sure they are cooled completely and put into an airtight container or ziplock bag. Use for salads or as a garnish on soups. You could even turn them into bread crumbs. There are lots of possibilities. Thank you. They are very tasty. These look so good! I will have to try them once I get off my Whole 30! They are really tasty. I made them with my GF Bread, but you could use any kind that you like.